As we know, most DVD movies are encrypted to prevent the dropping and dragging of their content with a view to secure data. For this general DVDs, there are a lot of software can be used to rip them. Free DVD Ripper is one free solution helping you to rip general DVDs with ease. However, since the appearance of Blu-ray disc, it has taken the fancy of more and more users. The general decrypter is no longer able to decrypt Blu-ray disc. Why this happen? It is because Blu-ray disc is protected with better encryption method, BD+ copyright protections. BD+ is a variant of a technology called self-protecting digital content (SPDC). This provides dynamic renewable protection. Title specific code is extracted from the disc and embedded into a virtual machine, security software checks are done by the disc to secure its own playback. Inevitably what this does is allows video content providers to renew content protection on BD-ROM players which have been hacked. At present, there are not so much tools available to eliminate problems such as BD+ copyright protections. For this purpose, you need a Blu-ray Decrypter such as WinX Blu-Ray Decrypter. 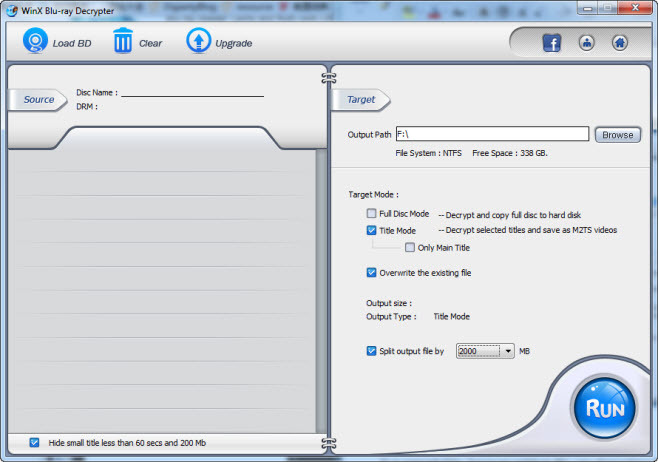 WinX Blu-Ray Decrypter allows you to decrypt Blu-ray disc and copy the Blu-ray movies to hard drive for better backup. You can enjoy them on your PC with DVD player software. The output files are working like the original without any video quality loss. You can download this Blu-ray decrypter for a try. It is easy to use for all users. Even you are a absolutely newbie, you can decrypt Blu-ray with this software in few clicks. Note: WinX Blu-Ray Decrypter is designed to decrypt the Blu-ray discs for your own personal use. It is not legal to decrypt Blu-ray discs for any other commercial purposes. If you are looking for an ideal Blu-ray backup solution, WinX Blu-ray Decrypter is the way to go. However, this free BD decrypter faces to all but only accepts legal use. Any illegal or offensive use is and shall be rejected. • Decrypt virtually all types of DVD with removal of CSS, Region Code, RCE, UOPs, Sony ARccOS, Disney DRM and other schemes with ease. • Rip DVD to MP4 (H.264), AVI, WMV, MOV, FLV, MPEG2, iPhone, iPad, Android, Xbox, PS3/4 at an ultra fast speed. How to copy Blu-ray to Hard Drive and Backup Blu-ray disc to computer hard drive? This article will teach you decrypt Blu-ray to Hard Drive for playback BD elsewhere. How to rip Blu-ray to AVI, DVD, MKV for playback Blu-ray elsewhere? This article will show you how to rip Blu-ray to most suitable format and preserve best quality. How to play Blu-ray disc on PC? DAPlayer is the best free Blu-ray Player software for Windows PC 2018 to play Blu-ray/DVD movies, HD videos (MKV, MTS, AVCHD).